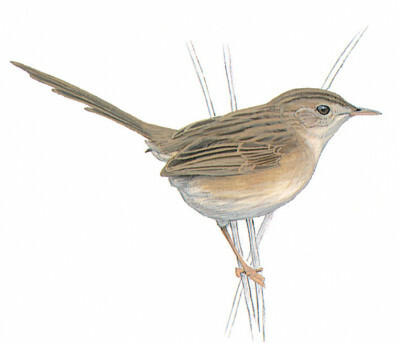 Small, plain, pale grey and buff warbler with long graduated tail, which is frequently raised. Streaked on crown, mantle and back. Round head, pale face and prominent eye. Tail dark above, pale below with black and white tips. Underparts off-white and streaked. Bill fine, black in breeding male, brown in female. Active and tame, raely seen on ground, it prefers lurking within the cover of vegetation.